Metalfencer is Spectra's 4-legged spider-like Mechanical Bakugan Trap. Metalfencer takes the form of a mechanical spider with three blue eyes that can freeze opponents, making them easy to defeat. His long tail can, not only can shoot lasers, but it can also wrap and squeeze his opponents tightly, eliminating them with its deadly stinger. His four mighty legs provide tremendous maneuverability. Metalfencer can assume Battle Unit Mode to enhance Viper Helios's fighting skills. With the toy it combines with Cyborg Helios Turbine Helios and Viper Helios to form Meta Helios. 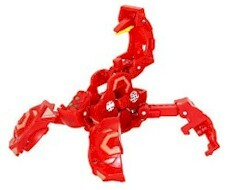 Purchase your Bakugan MetalFencer from Amazon now!